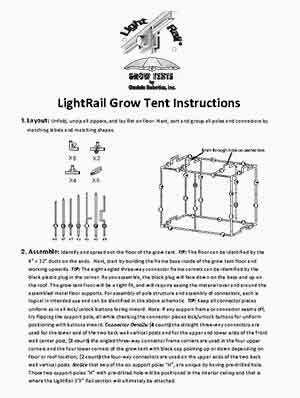 Introducing the all new patent pending design features of the LightRail Grow Tents by Gualala Robotics, built exclusively for LightRail light movers. LightRail Grow Tents take it to the next level with cutting edge, adaptable design that is ready to accommodate the LightRail 3.5 or 4.0 Motor in its special LightRail travel compartment. It’s also designed for easy expansion with LightRail Add A Lamp Kit(s) for up to three linked grows. Smart Robotics. Optimized Design. You can only get this with LightRail. (See photos, schematics and spec sheet below). 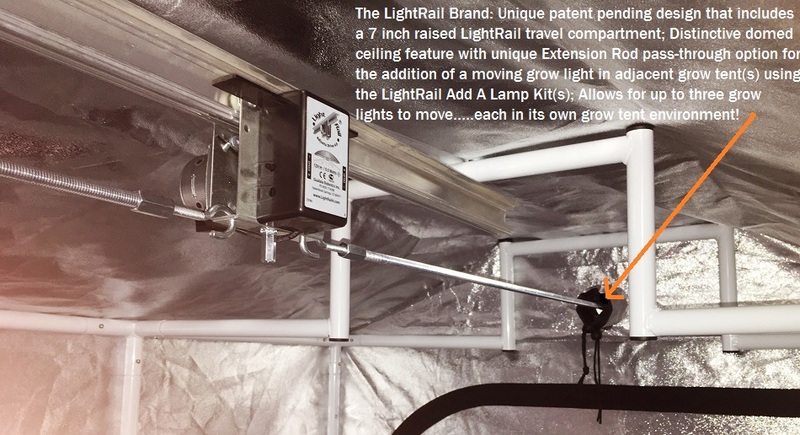 Unique patent pending design that includes a 7 inch raised LightRail travel compartment; Distinctive domed ceiling feature that serves as its own reflector, so either grow light reflector or bare bulb compatible; A more logical 6×4 design. Industry leading 25mm metal supports w/ metal easy lock connectors; Sturdy 100% opaque light blocking fabric for efficient function without needless extra bulk. Durable, light weight and light-tight. Secure duct cinching, no light-leak duct ports, double stitching, extra thick easy glide zippers, no snag build. Highly reflective interior. Handles the heaviest grow lights with smart design ready to match with the *LightRail 3.5 IntelliDrive Motor or the *LightRail 4.0 AdjustaDrive Motor. Additionally, it’s ready to match with LightRail *Add A Lamp Kit(s) for up to three linked grows; *Two versions available: 1) Complete Version including LightRail 3.5 Extreme Duty Motor with pre-installed Extreme Duty Trolley Wheels or 2) No Motor Version with no Motor included so is ready to match with the LightRail Motor that you already own. Either version comes with an easy-install 4 foot Rail section. Note: Any Add A Lamp Kits sold separately. Unique Extension Rod pass-through in the LightRail travel compartment allows for the addition of a moving grow light in the adjacent grow tent(s) using the LightRail Add A Lamp Kit(s); Allows for up to three grow lights to move….each in its own grow tent environment! 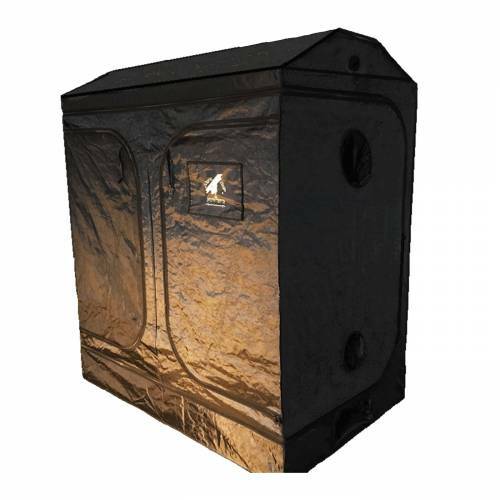 Can be one stand-alone grow tent or up to three linked grows with this unique grow tent end-to-end design. Large double door plus side access; Easy view Velcro window; Multiple ducting port and electrical port locations upper and lower; Micro mesh pest control pre-filters/pass through vents; Includes floor spill guard. The logical choice and the perfect alternative to customizing a separate grow room or buying expensive grow boxes. 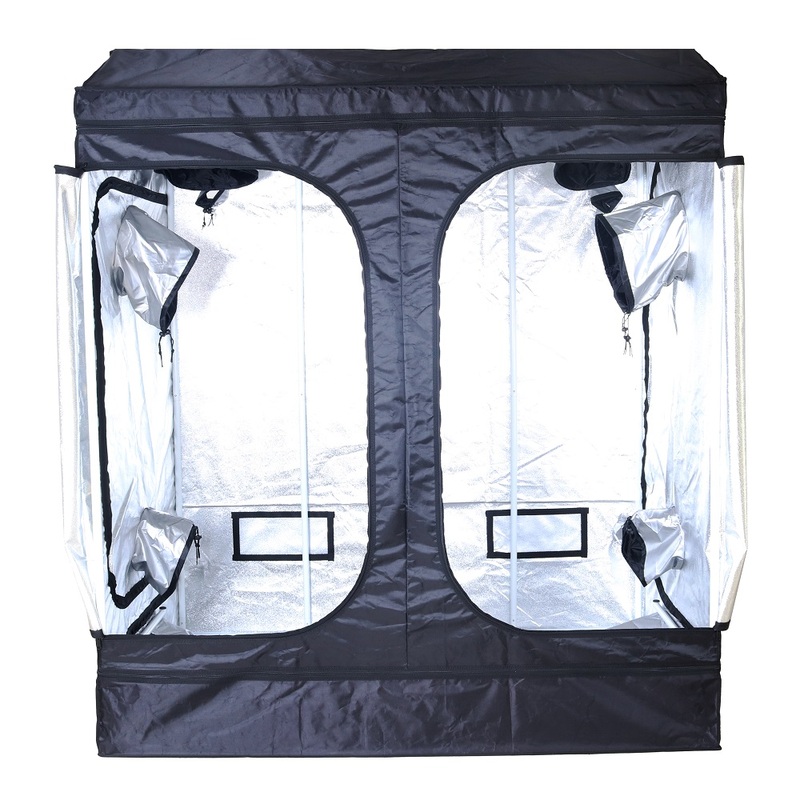 LightRail Grow Tents by Gualala Robotics are the first grow tents made exclusively for moving grow lights with LightRail light movers. When indoor grow lights move over the tops of the plants, the grow lamps can be positioned closer to the plants for maximized ppfd. Moving grow lamps can also penetrate to more leaf area, maximizing each grow light on two fronts at once. In addition, there are no hot spots, and shadow patterns are reduced. LightRail grow light mover kits provide this sun-like effect of closer and to more leaf area simultaneously. And, that’s while covering 30% more area. 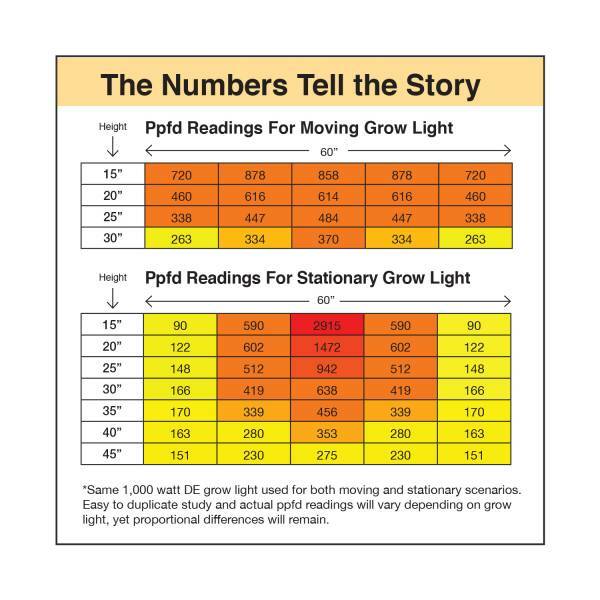 Whether in a grow tent, a grow room or a greenhouse; these ppfd numbers will translate to anything you grow and in any setting. This is significant. LightRail light movers are quality constructed instrument-grade robotics, solidly made in the USA to perform as an absolute workhorse, crop after crop and year after year. You can only get this with LightRail by Gualala Robotics. LightRail 4.0 AdjustaDrive Motor Extreme Duty Version, Light Mover Grow Light System, no Rail incl.